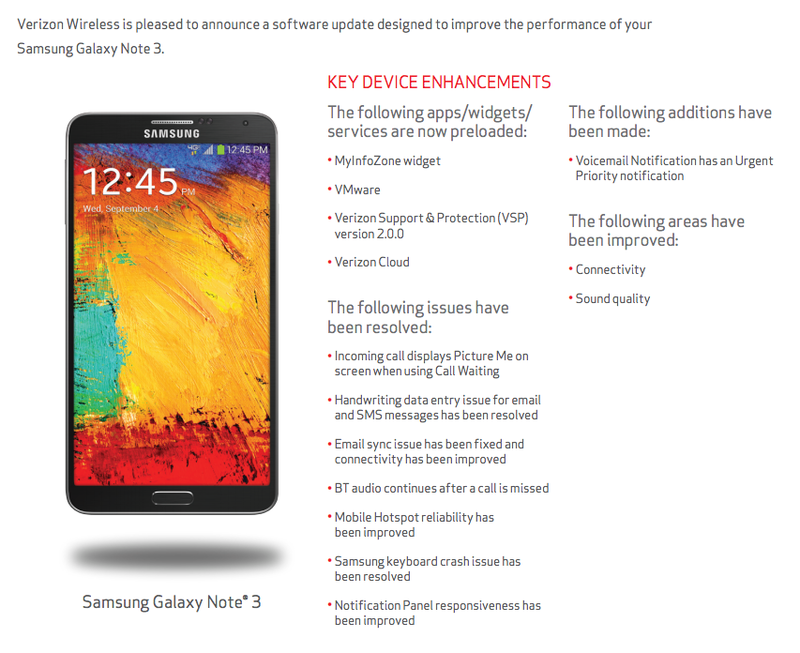 Verizon Galaxy Note 3 Set to Receive an Update – Improves Connectivity, Preloads Bloatware, and Fixes Lots of Bugs? According to Verizon support, their variant of the Galaxy Note 3 is due to receive an update in the very near future. The support docs appear to be poorly updated, as they include an old October date and no new build number, but the list of changes has certainly been tweaked. The last update that rolled out in early November only included two fixes, however, this new update addresses at least 10 items. Verizon is also claiming that this update was approved on 12/9. First, users will have to welcome in 4 new bloatware apps once they update: MyInfoZone widget, VMware, Verizon Support & Protection, and Verizon Cloud. After you get over that bundle of mess, you’ll find fixes for call waiting, email sync, Bluetooth audio after calls, more reliable Hotspot, less crashes in the Samsung keyboard, and more. Verizon and Samsung also attempted to improve connectivity an sound quality further. The full changelog is below. Should we find out more (like the build number or if this is different than the update from November), we’ll be sure to update this post.